Family Trees May Contain Nuts: RANDOM: Whale Channel B.C. Now this is what was better than catching that salmon. 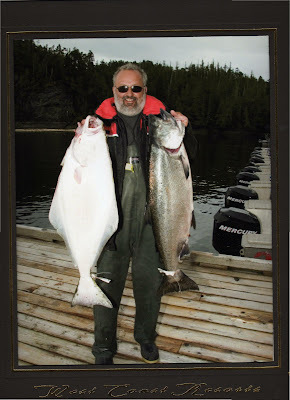 Catching a halibut and a salmon. My BB was fishing last year at Whale Channel on the coast of British Columbia. We live in the most amazing province and fishing is just one of the great perks. Halibut is my favorite fish. To judge the size of these guys I should tell you that my BB is 6'3" tall.